He is survived by his wife, Elvira (Balku) Nemeth with whom he enjoyed nearly 65 years of happy marriage, his daughters Mary Anne Nemeth (Joseph Phillips), Ann Arbor, MI and Dr. Julie (Richard) Shockley, Wellesley, MA, and sons Joseph S. (Joann) Nemeth Jr., Las Vegas, NV and Michael A. (Dana) Nemeth, Bowing Green, OH. He had six grandchildren: Joseph S. Nemeth III, Cassandra (Nemeth) Jackson, Samuel, William, and Harrison Shockley, Cole and Miles Nemeth, and two great-grandchildren, Jadyn and Jonah Nemeth. He was the son of the late Arpad and Mariska (Borso) Nemeth. His brother, Aladar Vilmos Nemeth, and sister, Jolan (Nemeth) Rogers, pre-deceased him. Dr.Nemeth served on the faculty at Bowling Green State University, OH (1965-90) in the College of Education as a Professor and Director of the Reading Center. He was Graduate Reading Faculty Chairman (training over 180 graduate assistants), NDEA Secondary Reading Institutes Director, and organized and directed numerous local and national Teacher Education Inservice Conferences. Additionally, he was on the faculties of Defiance College, OH (1990-93) and Edinboro University, PA (1961-63), was Director of the National First Grade Reading Studies, OH (1963-65), and began his career in education as a science and math secondary school teacher in West Mifflin, PA (1950-60). He completed his doctoral dissertation, which received the 1962 International Reading Association “Outstanding Dissertation Award,” at the University of Pittsburgh, PA, where he also received his Master’s degree. 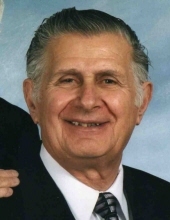 He graduated from Duquesne University, PA, in 1950 with a Bachelor’s degree, and was Vice President of his 1943 Glassport High School graduation class. There will be no memorial service in Ohio. A funeral service will be held on Friday April 5, 2019 at 10:00 at the Lebanon Chapel Mausoleum, 2701 Old Elizabeth Rd., West Mifflin, PA 15122, conducted by Rev. Dr. Daniel Borsay of the McKeesport, PA Free Hungarian Reformed Church. Arrangements by Strifflers of Dravosburg/W. Mifflin, 740 Pittsburgh-McKeesport Blvd., Dravosburg, PA 15034 (412-678-6192). Local arrangements are being handled by Dunn Funeral Home in Bowling Green. To send flowers or a remembrance gift to the family of Joseph S. Nemeth, please visit our Tribute Store. "Email Address" would like to share the life celebration of Joseph S. Nemeth. Click on the "link" to go to share a favorite memory or leave a condolence message for the family.